I’d heard that making your own chicken stock was simple and that it tastes infinitely better than the stuff you buy in the stuff you buy in the grocery store but I just thought, who has the time? Turns out I do. On Saturday night (don’t get jealous now!) I stayed in and cleaned my apartment from top to bottom and made chicken stock at the same time. It’s as simple as chopping up a few vegetables and throwing them into a pot with a few herbs, a whole bunch of chicken, and some water. 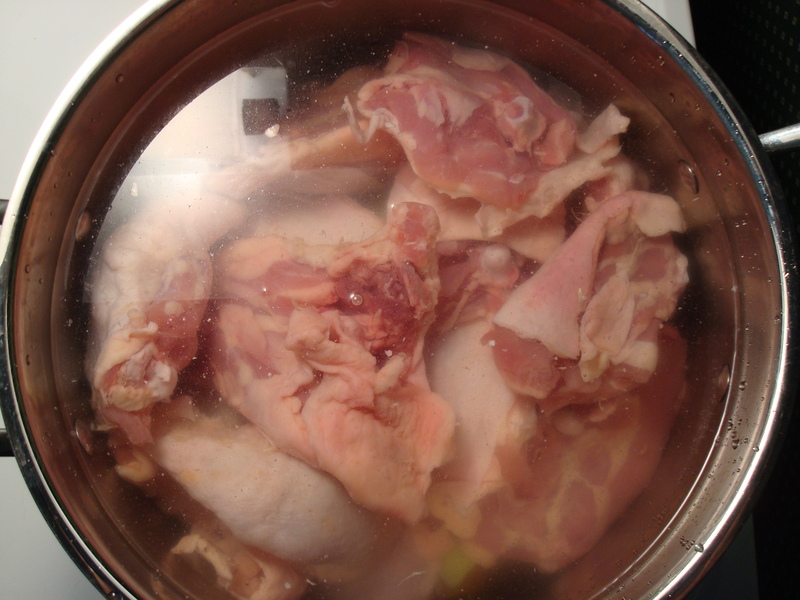 (I did some recipe research and it seems like most recommend using chicken bones, backs, or thighs so that you are not wasting meat.) You bring all of that to a boil and then let it simmer for a couple of hours. 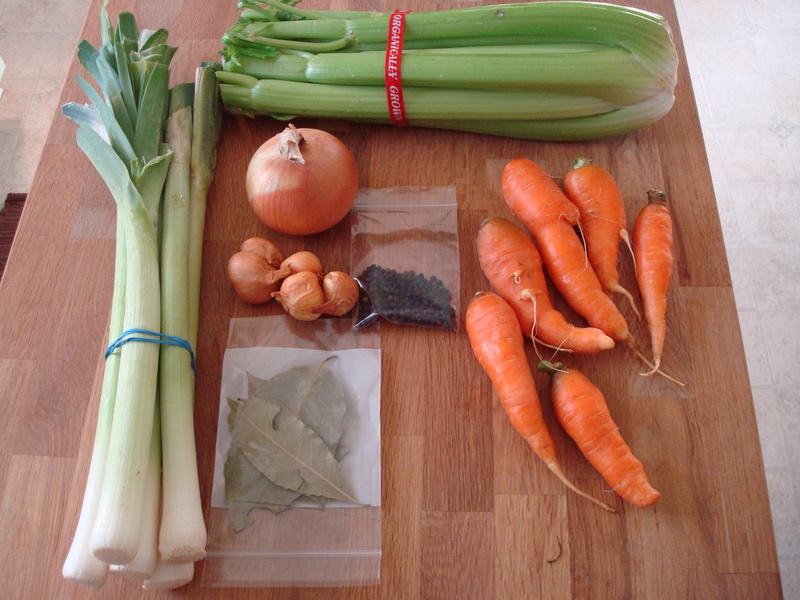 Place all the ingredients into an 8-quart stock pot and cover with cold water. Bring to a boil over high heat. As the stock approaches a boil, remove any impurities that rise to the top by skimming with a ladle. Reduce the heat and simmer the stock for 3 to 4 hours, continuing to skim impurities from time to time while the stock cooks. Taste after 3 hours for the strength of stock you want. Remove from the heat and let the stock sit for 10 to 15 minutes, then ladle through a fine strainer. Once strained, remove the fat from the stock by skimming with a ladle (see Helpful Hint). Cool by placing the container of strained stock in an ice water bath, then refrigerate. The stock will keep for about 1 week in the refrigerator, or freeze in 1-cup batches. 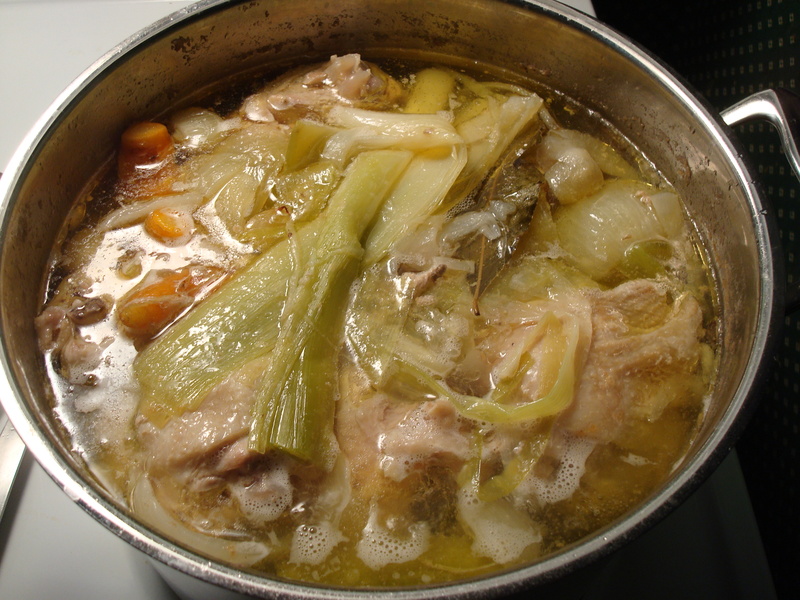 Cook’s Note: Another way to defat the stock is to place the cooled stock in the refrigerator overnight. The fat will set on the top and can be easily spooned off. Variation: Use a large (5- to 6-pound) roasting chicken in place of the bones. Use the meat for chicken salad or croquettes.